Whether your Arizona business is just starting to take shape and you are doing your due diligence, forming your company’s business plan, or your business is a seasoned veteran with years of experience, securing the proper insurance plan for your business is always an important step in ensuring that your company will be prepared in case of a disaster or a claim being filed against your Arizona Company. When first sitting down with our clients, we gather as much information as possible about their business, so our agency can recommend the proper Phoenix insurance coverages for their particular business needs. The first insurance coverage we generally discuss is General Liability Insurance. General Liability Insurance is a necessary first step for every business, whether your business is a retail or wholesale operation, a general contractor or a trade contractor, product distributor or manufacturer, or one of the many diverse businesses that make up Arizona companies. Commercial General Liability Insurance can protect your Scottsdale Arizona business from claims of bodily injury, property damage, and negligence related to your business activities, and, in addition, can cover your legal defense costs associated with a claim being filed against your company. Depending on what your business does, additional coverages that are available to protect your Arizona business are Property Insurance coverage, which is very important if your company has an office, retail or wholesale store, or factory location with an owned or leased building which contains company property, machinery, equipment, stock, or inventory. Cyber Liability Coverage, if your company does business via the web or keeps clients’ valuable data on its servers, is a must insurance coverage for your company. Employment Practices Liability Insurance, or EPLI, is highly recommended if your company has employees, especially since the average EPLI claim paid is fast approaching six figures. Product Liability Coverage is an absolute must for your company if your company sells, distributes, or manufactures any type of product. If your company has a board of directors, then PJO Insurance Brokerage can show you just how important it is that you protect those board members with Directors & Officers Professional Liability coverage. In addition, if your Arizona business is of a professional services nature, then your company will need to acquire an Errors and Omission or Professional Liability Insurance policy to protect itself from claims due to negligence or the failure to perform your company’s professional services. As you can see, when discussing insurance options for your Arizona Business, there are numerous insurance plans and many carriers available to choose from. PJO Insurance Brokerage understands that no two businesses are alike, and this is why our professional brokers take the time to discuss, in detail, with clients about their particular company and what business insurance coverages would fit in their insurance plan to ensure that they are protected. 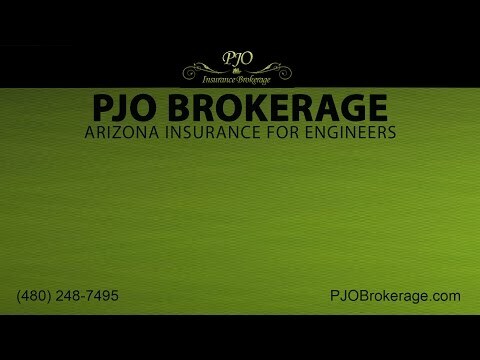 At PJO Insurance Brokerage, we also understand that certain businesses are going to be more difficult to secure coverage for because of the risks associated with their classes of business, and since we are an independent agency and have several markets available, we can work to help these unique Arizona businesses find coverage with various options from various carriers. If you would like to explore how having the professional and experienced brokers at PJO Insurance Brokerage can help you create an insurance plan for your Arizona Company’s insurance requirements, please call us today to set an appointment. We look forward to hearing from you.